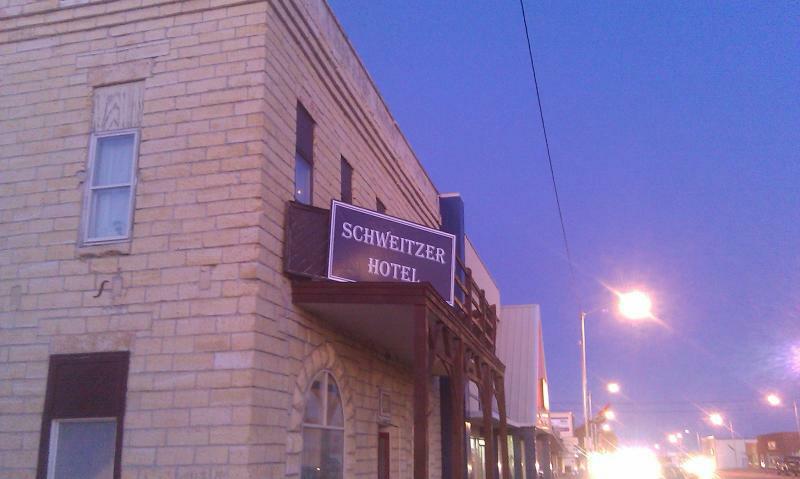 The Schweitzer Hotel was built in 1886 by J.P. Pomeroy. It is an original building in our small quaint town. The hotel has charm, warmth and comforts of home. Step back in time and enjoy a feeling of another era but, don't give up your modern conveniences. We have WiFi, beverage bar, microwave, freezer and refrigerator available for our guests. Take advantage of the 1886 lobby to cuddle into one of our comfy chairs and read a book or socialize with friends. Whether you are visiting our area for a family reunion, hunting, funerals, business, Jayhawker Rodeo, Nicodemus Homecoming, Millbrook Wranglers Shooting Event or traveling through, we will make you feel right at home. We are very accommodating with late check-outs available for our guests that are visiting for funerals or weddings. When you walk into the front door we will do our best to make you feel at home! Your personal check, credit card or cash gladly accepted. Step back in time in our 1886 hotel!